Sophistication and distinction have arrived to the Riviera Maya. Come visit the all-suite Secrets Silversands Riviera Cancun, a modern marvel in contemporary design. With eight gourmet restaurants-seven of them á la carte-plus eight posh bars are the perfect places to enjoy a quiet romantic dinner, catch up with friends, or meet new ones. 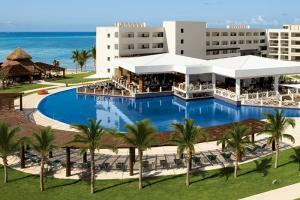 Secrets Silversands Riviera Cancun is situated on the Yucatan Peninsula, a mere 15 miles south of Cancun.